1. Bring the milk to a simmer in a small saucepan and add the smoked fish. Cook gently until the fish flakes apart easily – about 8-12 minutes. Allow to cool slightly then flake the flesh into bite-sized chunks. 2. Heat a tablespoon of coconut or olive oil in a large shallow pan until it reaches medium heat. 3. Add the sliced onion and cook for 5 minutes until just softened before adding the mushrooms. 4. Stir in the curry paste and heat, stirring constantly for about a minute. 5. Tip in the rice and lentils and stir to thoroughly coat with the spices. Add the frozen peas and cooked fish to the mix and heat through for 3-4 minutes until piping hot. 6. Arrange on serving dishes and top with the boiled eggs and coriander. The addition of lentils in this warming breakfast classic help to keep you feeling fuller for longer, but importantly are an excellent source of essential minerals, B vitamins and protein – and very little fat. To make this dish super-quick to put together, use packet/pouch rice and lentils (with no added nasties). Green lentils are an absolute powerhouse of nutrition. 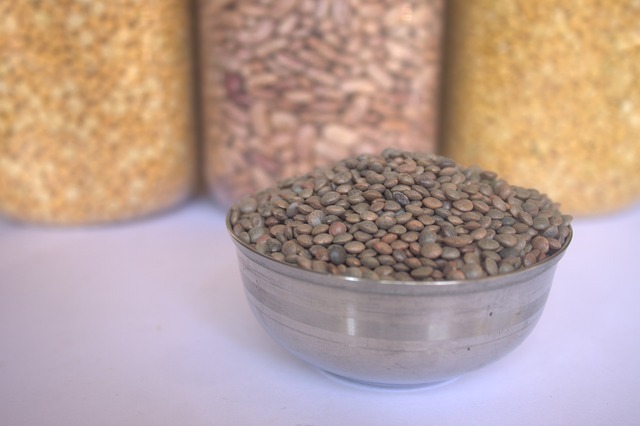 Especially rich in lean protein, iron, folate and dietary fibre, lentils are also a good source for vitamin K, zinc, potassium and niacin.